I am delighted to present �Magical Winter Snow Forest Friends,� an original one-of-a-kind creation by me, The Primitive Lady. Mr. Snowman and Mr. 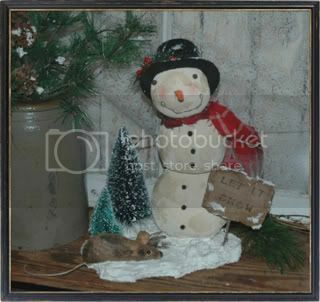 Mouse have become the best of friends among the magical winter snow forest. They love to frolic through the snow covered trees and then gather by a warm fire and reflect upon the magical beauty of the forest. Mr. Snowman and Mr. Mouse are secured to a Styrofoam base covered with snow, adorned with sisal trees, a small pile of snowballs, and a tiny fire made from real sticks. Mr. Snowman was made from painted muslin. He has rusty jingle bell eyes, an orange painted pipe cleaner nose, a rusty wire mouth, rosy red cheeks, real stick arms, black chenille popcorn buttons, a black top hat adorned with greenery and red pip berries and a splash of sparkly snow. He also wears a red, white, and black plaid homespun scarf. I�ve also given Mr. Snowman a slightly aged appearance and sprinkled him with a bit of diamond dust to make him sparkle as part of the magic of it all. The pictures look a bit blotchy. That's just the lighting. Mr. Mouse was made from heavily aged cotton batting, with black bead eyes, floss whiskers, and a string tail. As the finishing touch, I added a primitive sign that reads, �Let it Snow,� made from aged cardboard and a real stick. The Magical Forest measures 8� long, 6� wide, and 10� high and will arrive signed and dated. The Magical Forest can be displayed anywhere you�d like to add a little magical wintery cheer. They will definitely keep you smiling!